The phrase Myers Briggs is most often used to describe a personality theory developed by Isabel Briggs Myers and her mother Katherine Briggs. It explains some of the main differences between people and is often used to help choose a career, improve relationships, develop leadership skills, etc. 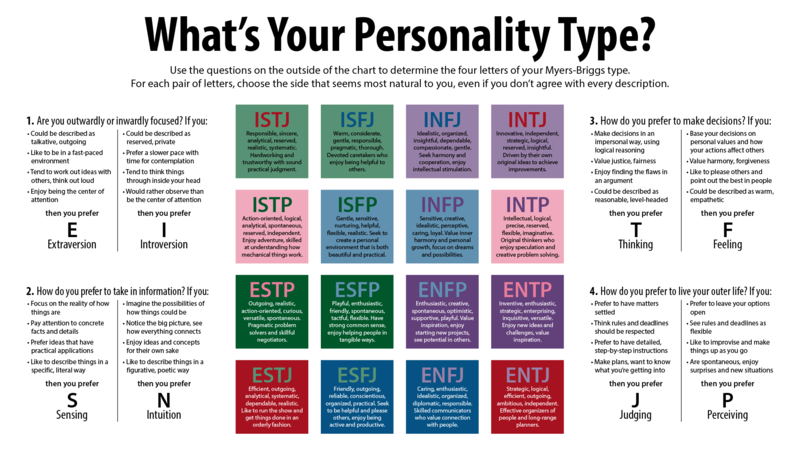 When the phrase Myers Briggs is used in the name of a personality questionnaire, it refers specifically to the commercial Myers-Briggs Type Indicator® instrument, published by Consulting Psychologists Press. However, there are many alternative questionnaires that produce a similar result. People and things (Extraversion or “E”), or ideas and information (Introversion or “I”). Facts and reality (Sensing or “S”), or possibilities and potential (Intuition or “N”). Logic and truth (Thinking or “T”), or values and relationship (Feeling or “F”). A lifestyle that is well-structured (Judgment or “J”), or one that goes with the flow (Perception or “P”). In Myers Briggs theory, for each pair you prefer one style over the other. You combine the letters associated with your preferences to get your Myers Briggs personality type. For example, having preferences for E, S, T and J gives a personality type of ESTJ. Although you have preferences, you still use all eight styles – in the same way that most people are right-handed but they still use both hands. Extraversion and Introversion – The first pair of styles is concerned with the direction of your energy. If you prefer to direct your energy to deal with people, things, situations, or “the outer world”, then your preference is for Extraversion. If you prefer to direct your energy to deal with ideas, information, explanations or beliefs, or “the inner world”, then your preference is for Introversion. Sensing and Intuition – The second pair concerns the type of information/things that you process. If you prefer to deal with facts, what you know, to have clarity, or to describe what you see, then your preference is for Sensing. If you prefer to deal with ideas, look into the unknown, to generate new possibilities or to anticipate what isn’t obvious, then your preference is for Intuition. The letter N is used for intuition because I has already been allocated to Introversion. Thinking and Feeling – The third pair reflects your style of decision-making. If you prefer to decide on the basis of objective logic, using an analytic and detached approach, then your preference is for Thinking. If you prefer to decide using values – i.e. on the basis of what or who you believe is important – then your preference is for Feeling. Judgment and Perception – The final pair describes the type of lifestyle you adopt. If you prefer your life to be planned, stable and organised then your preference is for Judging (not to be confused with ‘Judgmental’, which is quite different). If you prefer to go with the flow, to maintain flexibility and respond to things as they arise, then your preference is for Perception. Serious and quiet, interested in security and peaceful living. Extremely thorough, responsible, and dependable. Well-developed powers of concentration. Usually interested in supporting and promoting traditions and establishments. Well-organized and hard working, they work steadily towards identified goals. They can usually accomplish any task once they have set their mind to it. As an ISTJ, your primary mode of living is focused internally, where you take things in via your five senses in a literal, concrete fashion. Your secondary mode is external, where you deal with things rationally and logically. ISTJs are quiet and reserved individuals who are interested in security and peaceful living. They have a strongly-felt internal sense of duty, which lends them a serious air and the motivation to follow through on tasks. Organized and methodical in their approach, they can generally succeed at any task which they undertake. ISTJs are very loyal, faithful, and dependable. They place great importance on honesty and integrity. They are “good citizens” who can be depended on to do the right thing for their families and communities. While they generally take things very seriously, they also usually have an offbeat sense of humor and can be a lot of fun – especially at family or work-related gatherings. ISTJs tend to believe in laws and traditions, and expect the same from others. They’re not comfortable with breaking laws or going against the rules. If they are able to see a good reason for stepping outside of the established mode of doing things, the ISTJ will support that effort. However, ISTJs more often tend to believe that things should be done according to procedures and plans. If an ISTJ has not developed their Intuitive side sufficiently, they may become overly obsessed with structure, and insist on doing everything “by the book”. The ISTJ is extremely dependable on following through with things which he or she has promised. For this reason, they sometimes get more and more work piled on them. Because the ISTJ has such a strong sense of duty, they may have a difficult time saying “no” when they are given more work than they can reasonably handle. For this reason, the ISTJ often works long hours, and may be unwittingly taken advantage of. The ISTJ will work for long periods of time and put tremendous amounts of energy into doing any task which they see as important to fulfilling a goal. However, they will resist putting energy into things which don’t make sense to them, or for which they can’t see a practical application. They prefer to work alone, but work well in teams when the situation demands it. They like to be accountable for their actions, and enjoy being in positions of authority. The ISTJ has little use for theory or abstract thinking, unless the practical application is clear. ISTJs have tremendous respect for facts. They hold a tremendous store of facts within themselves, which they have gathered through their Sensing preference. They may have difficulty understanding a theory or idea which is different from their own perspective. However, if they are shown the importance or relevance of the idea to someone who they respect or care about, the idea becomes a fact, which the ISTJ will internalize and support. Once the ISTJ supports a cause or idea, he or she will stop at no lengths to ensure that they are doing their duty of giving support where support is needed. The ISTJ is not naturally in tune with their own feelings and the feelings of others. They may have difficulty picking up on emotional needs immediately, as they are presented. Being perfectionists themselves, they have a tendency to take other people’s efforts for granted, like they take their own efforts for granted. They need to remember to pat people on the back once in a while. ISTJs are likely to be uncomfortable expressing affection and emotion to others. However, their strong sense of duty and the ability to see what needs to be done in any situation usually allows them to overcome their natural reservations, and they are usually quite supporting and caring individuals with the people that they love. Once the ISTJ realizes the emotional needs of those who are close to them, they put forth effort to meet those needs. The ISTJ is extremely faithful and loyal. Traditional and family-minded, they will put forth great amounts of effort at making their homes and families running smoothly. They are responsible parents, taking their parenting roles seriously. They are usually good and generous providers to their families. They care deeply about those close to them, although they usually are not comfortable with expressing their love. The ISTJ is likely to express their affection through actions, rather than through words. ISTJs have an excellent ability to take any task and define it, organize it, plan it, and implement it through to completion. They are very hard workers, who do not allow obstacles to get in the way of performing their duties. They do not usually give themselves enough credit for their achievements, seeing their accomplishments simply as the natural fulfillment of their obligations. ISTJs usually have a great sense of space and function, and artistic appreciation. Their homes are likely to be tastefully furnished and immaculately maintained. They are acutely aware of their senses, and want to be in surroundings which fit their need for structure, order, and beauty. Under stress, ISTJs may fall into “catastrophe mode”, where they see nothing but all of the possibilities of what could go wrong. They will berate themselves for things which they should have done differently, or duties which they failed to perform. They will lose their ability to see things calmly and reasonably, and will depress themselves with their visions of doom. In general, the ISTJ has a tremendous amount of potential. Capable, logical, reasonable, and effective individuals with a deeply driven desire to promote security and peaceful living, the ISTJ has what it takes to be highly effective at achieving their chosen goals – whatever they may be.